Shmee Has A Good Time At The El Royale! Bad Times at the El Royale is the type of movie that actors love, and that audiences are mostly indifferent to. The roles are meaty and have lots of great dialog, but because of that the movie can feel slow and plodding. However, if you enjoy watching actors ply their trade, you will find a lot to like at the El Royale. Bad Times works best if you know nothing about it. The trailers, as sparse as they are, give too much away, but the title is discriptive enough. A small group of people check in to a run down motel called the El Royale, for mostly doubious reasons, and they do not enjoy their stay. There is a lot of talking and well earned mistrust in Bad Times at the El Royale, and actors enjoying talking and mistrusting each other. Dakota Johnson in perticular seems to be happy with something interesting to do, but if you had just finished making three Fifty Shades movies, you would probably be happy with a real acting gig as well. It is not just Dakota Johnson having a good time, Jeff Bridges, Jon Hamm, Cailee Spaeny, Lewis Pullman and Chris Hemsworth are all seemingly having the times of their lives with this script. Hemsworth in particular you could tell was very exctied to be playing a villain instead of a straight laced norse god. The real standout however was newcomer to the silver screen Cynthia Erivo. While she has made a name for herself on Broadway, she is now a movie star in the making, and she more than holds her own against all this top teir talent. The only disapointment I had with this film was that the directing, while fine, was just there to serve the script. The trailers made it seem like it was ozzing with style, but in fact it has more of a dingy film noir look to it, which is fine, but even then, a movie with this much talking could have used a little directoral razzamatazz. I enjoyed Bad Times at the El Royale quite a bit, but I am not sure you have to run out to theaters to see it. It will be just as good at home on the streaming service of your choice. 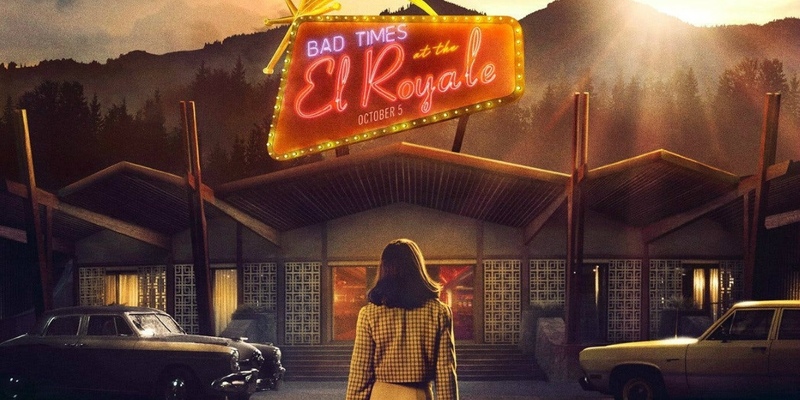 Also, if you need a little more than good acting in your movies, Bad Times are probably what you will have at the El Royale. However, for film buffs like me who like quirky, talky character flicks, you will probably want to check in to the El Royale. Previous PostPrevious Shmee Destroys Great Britain In Forza Horizon 4! Next PostNext The Diablo Immortal Controversy Is Everything That Is Wrong With Fandom!